It’s the most wonderful week of the year! AZ Restaurant Week! Not kidding, for someone who’s biggest hobby is eating this is better than any other week of the year, because you can have food, food and more food at the top locations of our area! We went to Top of the Rock restaurant in Tempe today and it was worth. Every. Penny! 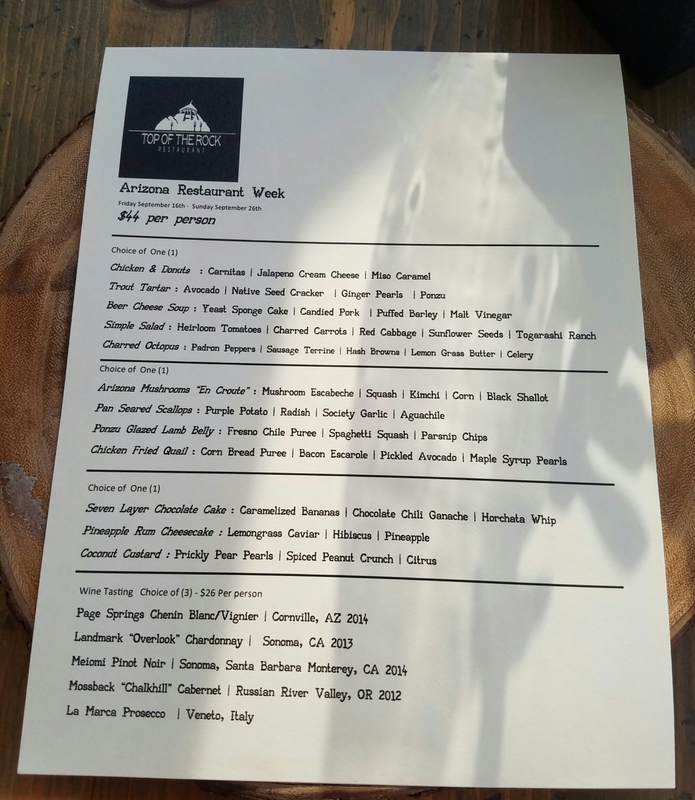 A little introduction: during AZ Restaurant Week, this year happening from September 16th to September 25th, local restaurants offer 3-course menus for $33 or $44 – the perfect opportunity to experience new delicious cuisine! Our dinner at Top of the Rock definitely was an experience. The ambience of this restaurant, which actually does sit on top of a rock, is the perfect mixture of rustic and fancy. 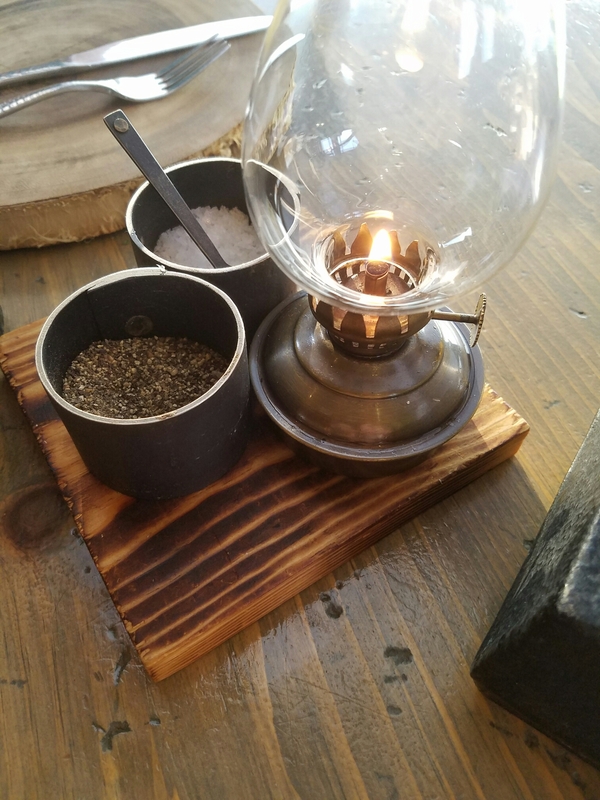 The tables are decorated with wooden charger plates, salt and pepper come in dark metal pots with a matching spoon, sitting on a wooden plate with an oil lamp, and a cast iron tea pot with succulents planted in it just brought everything to another level. This is exactly the style I love. I want to move into this location, now! 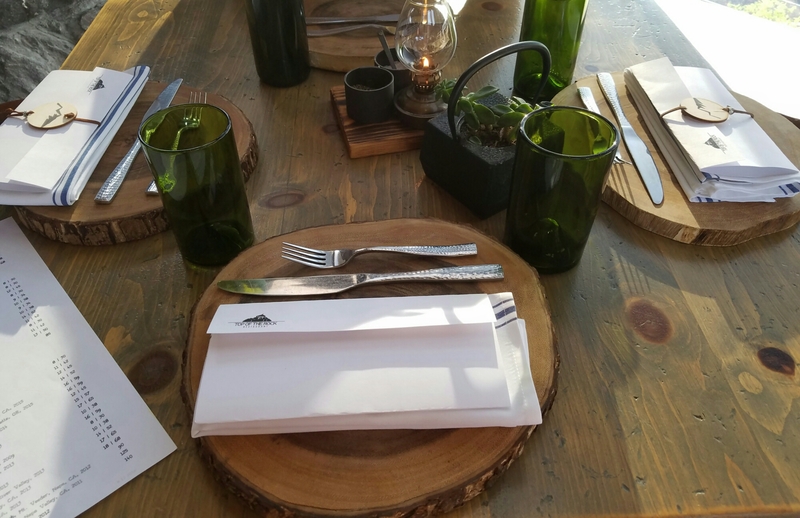 The menu offered a lot of selection which made it hard for us to decide – everything sounded equally delicious. I contemplated just eating two 3-course menus in a row but I have to consider my limits – this sort of gluttony would exceed the capacity of my stomach. Not that I wouldn’t try if I could…. 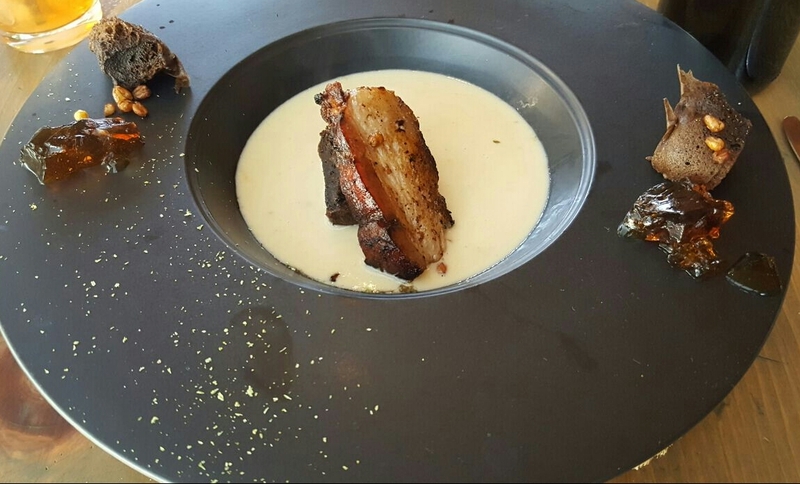 One look at the menu and you see that this is elaborate cuisine that really showcases the ingredients without going over the top with twenty different components per bite. 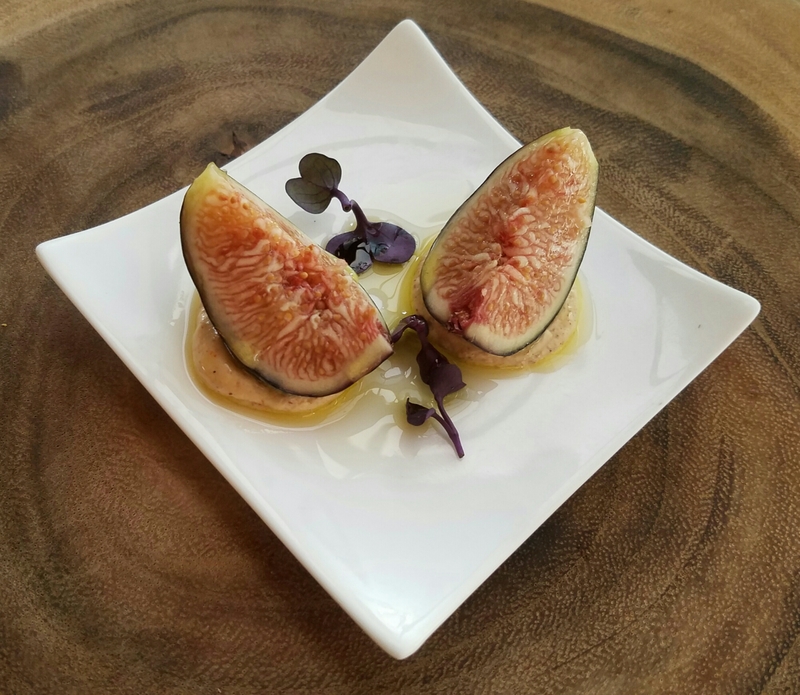 We did enjoy an amuse bouche before the actual menu which was figs on ancho chili chevre with a drizzle of olive oil. What can I say: if you can make me eat goat cheese (ew!) then you’re a magician in the kitchen, and I did eat this ancho chili chevre, and I enjoyed it, I could have eaten ten more of these plates. If a meal starts like this it can only be top notch. For our appetizers we picked the beer cheese soup with yeast sponge cake, candied pork, puffed barley and malt vinegar, and the charred octopus with Padron peppers, sausage terrine, hash browns, lemon grass butter and celery. My husband had the beer cheese soup and he said it was beyond words. I tried a spoonful and it proved my idea of receiving the delightful art of a kitchen magician. I’m not exaggerating, I have no idea how you can put that much flavor into a soup. The presentation alone was mindblowing, the malt vinegar came as a jelly which is wildly creative and adds an unexpected new texture to the dish. I opted for the charred octopus and I couldn’t have made a better choice. The first bite already catapulted me straight to culinary heaven. 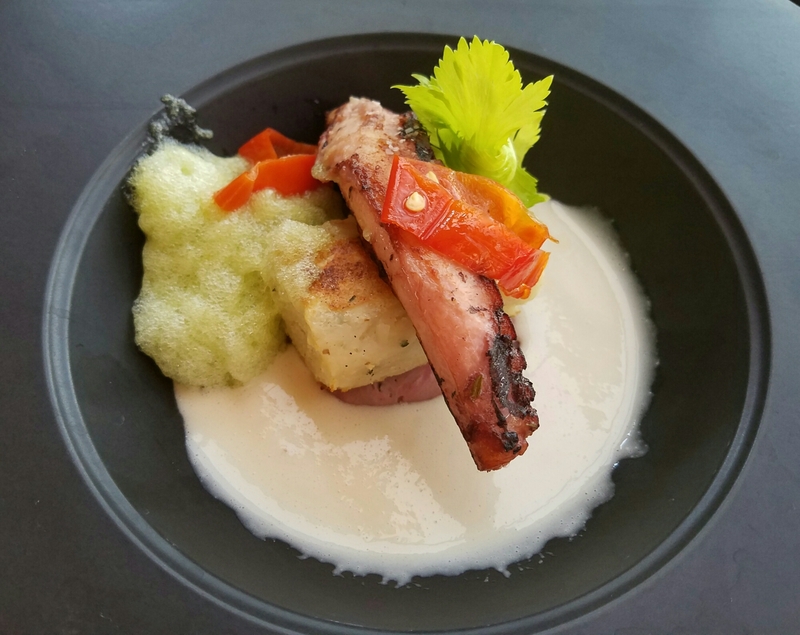 The octopus was prepared perfectly, the charred flavor together with the tangy but fresh lemongrass butter – incredible. Even the celery foam, with celery not exactly being my favorite vegetable, just added another depth of flavor to the dish that I wouldn’t have wanted to miss. The hash brown reminded me more of a potato cake, nonetheless very tasty, and the sausage terrine added just the right saltiness to the dish. Our entrées did not at all disappoint either. My husband chose the pan seared scallops with purple potato, radish, society garlic and aguachile, I decided on the chicken fried quail with corn bread puree, bacon escarole, pickled avocado and maple syrup pearls. Again, just presentation wise it is a joy. 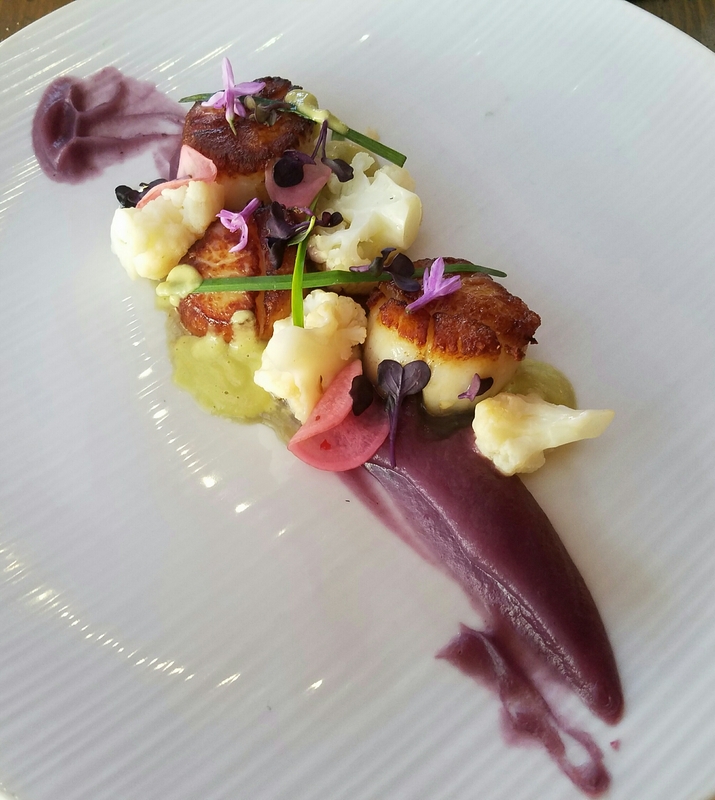 My husband said the scallops were so sweet and tender, and the dish was very balanced in flavors – the sweetness of the scallops and the purple potato puree was cut by the spicy aguachile sauce, and the fresh and crisp cauliflower brought it all together by toning down the strong flavors just enough. 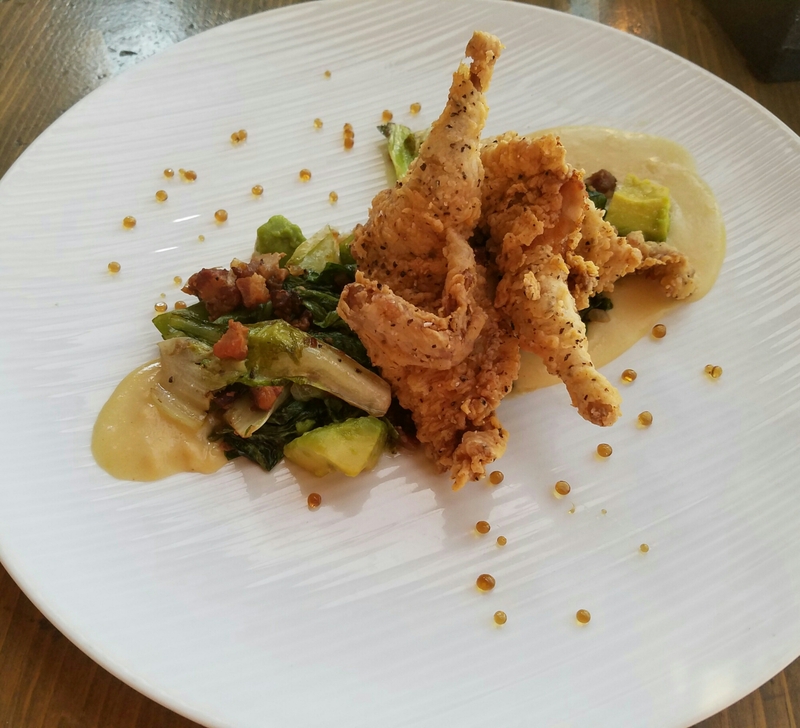 My dish of chicken fried quail made me smile thanks to the tiny maple syrup pearls, I just like little additions to the plate that make the dish look so beautiful but still serve a purpose beyond just being decorative. I had to eat the quail “KFC style”, with my hands – a surgeon might be able to use knife and fork on a minuscule bird like this, but me… it was worth the greasy fingers, the breading was so crunchy and flavorful and the gamey taste of the juicy quail meat was simply delightful. The savory bacon escarole matched it perfectly without adding too much saltiness, and the soft avocado added a pleasant creaminess. The corn bread pudding had a citrus flavor to it that I did not enjoy all too much, it kind of clashed with the savory bacon, however, the rest of the dish was absolutely well-prepared. Dessert made us sad. Why? Because it signals that this feast is over soon! The desserts itself though… they made our hearts sing. 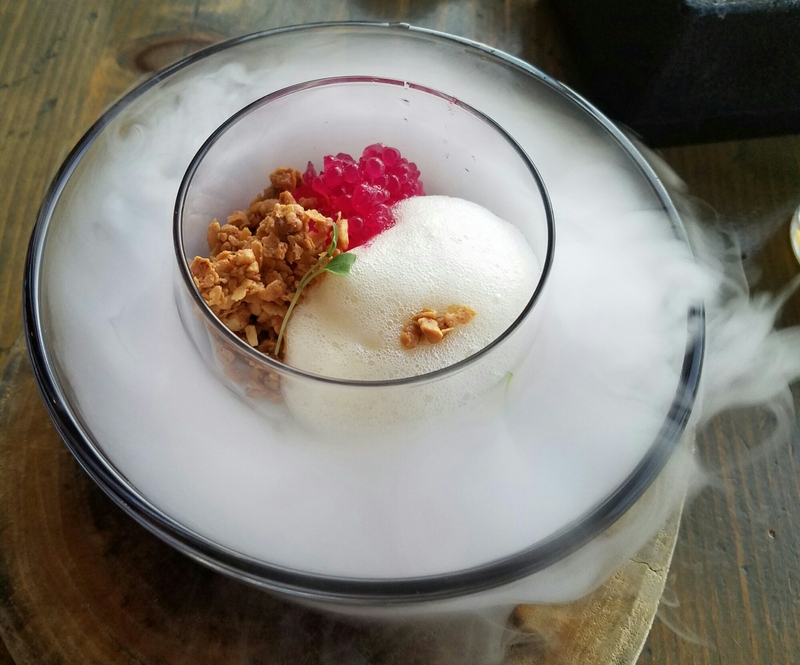 For my husband it was the pineapple rum cheesecake with lemongrass caviar, hibiscus and pineapple, which also spoke highly to me, but I went for my all time favorite flavor of coconut and chose the coconut custard with prickly pear pearls, spiced peanut crunch and citrus. I guess I don’t have to go into depth about the presentation again. I will later though when I get to my dessert, but first: cheesecake! 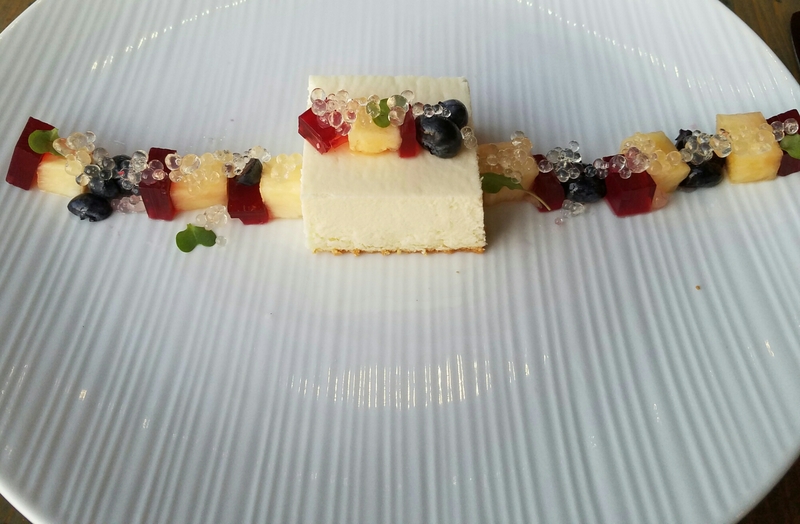 My husband said it probably was the best cheesecake he has ever eaten because it was airy and light but still moist and flavorful, and the fruit and lemongrass caviar added a note of freshness. The hibiscus jelly was a bit too dense for his taste, it reminded more of a gummy candy. Flavor wise though, no complaints! Now I will elaborate on presentation again. Look. At. This. My coconut custard came sitting in a bowl filled with flower petals, herb leaves and chunks of dry ice, and our waiter poured clove scented hibiscus tea into it to create this fog that tickled my nose with that delightful scent of spicy clove and fruity hibiscus that reminded me of mulled wine. Adding this kind of experience to a dish, where you just smell another component without tasting it, that is simply genius. The actual taste of the tea would not have done anything for the coconut custard but the scent of it definitely brought it to another level. It was more than just a show, it was what made the dessert complete. The custard itself was incredibly rich and had a very natural pleasant coconut flavor. The prickly pear pearls cut through this richness with some fresh tang, the peanut crunch brought another texture into it and its deep and slightly salty taste complimented the more lightly flavored custard so well. The citrus foam added the acidity that definitely was needed, however, for me it was too citrusy, because I already had strong citrus notes in the appetizer and the entrée and my palate was kind of saturated with this particular flavor. Nonetheless was this a very enjoyable completion of the menu. Will we be back? That is highly likely! If I made you hungry now, please visit Arizona Restaurant Week and see which restaurant speaks to you – it really is an amazing opportunity to find some new spots to savor meals truly fit for a king! Maybe your choice will be Top of the Rock too?